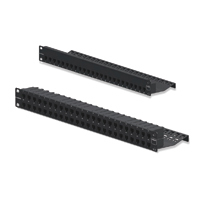 Z-MAX 6 UTP patch panels harness unprecedented performance and reliability in a high-density modular solution. These complete patch panel kits combine 19 inch patch panels with Z-MAX 6 panel outlets to offer an exceptional category 6 patching solution. The Z-MAX 6 UTP patch panels facilitate a world-class installation for data centers and telecommunications rooms by offering an attractive appearance combined with flexible labeling and color coding options. The Z-MAX panel modules feature a patent pending angled IDC contact pattern to exploit the widest module cross-section, enabling up to 48-ports in just 1U of rack space.